I'll just say it out loud: I don't believe in hell. I don't care what the Bible may or may not say on the matter. I don't care what the Catechism of the Catholic Church teaches. The concept of hell is monstrously absurd -- and no sane person should believe it. I don't need to argue my point of view by citing this or that scripture, or some or other famed theologian. I arrived at my conclusion that way most sane people do: By the use of reason and a dash of common sense. The doctrine of hell -- the concept, the idea, the premise -- is that a loving God created a place of eternal torment for people (and angels) who refuse to love Him. To avoid this dreadful fate, evangelical Christians talk about taking Jesus as one's personal savior. Muslims talk about making their submission to Allah. Catholics stress the need to be baptized and die in communion with the Church in order to be saved. 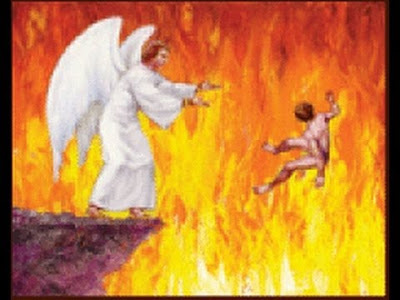 The basic idea is the same: Unless you jump through some hoops, you will spend eternity in a "lake of fire." It's important to understand the idea, to dig deep into it, to genuinely comprehend it. Firstly, it cannot be stressed enough: Hell is an utterly monstrous idea. It is a shocking creation. It's twisted. It's sick. The psychology beneath it is deeply abnormal. Eternal punishment is ... eternal. And that's a very long time. No matter how many eons might pass in such a place, it would still be only the beginning. Millions of years could pass ... billions ... trillions ... trillions upon trillions of years ... but still , it would only be the beginning. The torment, the agony, the dreadful pains, would never end. Never. No matter how much time passed, the agony would go on and on for eternity. What could a finite human being do to deserve such an infinite punishment? If you don't grasp the full horror of it, spend some time with it. Chew on it. Think about it. Dig into it. Immerse yourself fully into the idea of it. The more you think about it, the more you realize what an insane idea it is. And not insane with a small case i, but INSANE. Sick. Twisted. Preposterous. Literally beyond belief. But the really insane thing is to attribute the creation of hell to a "loving God." A great many Christians will tell you flat out that if you don't accept Jesus as your personal savior, you will go to hell. And they believe it. And they are genuinely distressed at the idea that you would prefer such a fate when all you have to do to "save yourself" is accept Jesus as your personal savior. They are quick to point out that this isn't their idea, that this is God's plan, that it's all there in the Bible. As indeed it seems to be. Here's the rub. A loving God created you, but if you don't love Him back, He will destroy you forever in the lake of fire. You have to ask yourself. If I stood in front of you with a knife to your throat and insisted that you "love" me, how would you feel? If your safety and well being depended on loving me, would it be love? It's ridiculous, is it not? Yet we are asked to believe this is what God expects of us. This is "God's plan." Unless you agree to "love" this all-powerful entity, you will be utterly destroyed. This is not love. It's insane to even have to point it out. This is not how love works. This is not how you treat someone you love. This is deeply unhealthy. This is perverted, sick, twisted, abnormal. And to attribute it to God is complete foolishness. It's insulting. I'm not the first to arrive at this conclusion by any means, but it's always been a well-kept secret. Something in us wants the idea of hell to be true. Right? We feel that people like Adolf Hitler deserve a place of eternal torment in the afterlife. We feel his crimes deserve it. We want him to be punished. The Jehovah's Witnesses have an interesting solution to this dilemma. They believe that people who have rejected God will simply wink out of existence when they die. God will remember them no more, and they will exist no more. No need for a place of eternal torment. Just a respectful acknowledge of a choice that a person made. Different demonstrations have different ideas. Hardliners will tell us that without the threat of the punishment of hell, people will not be good. What I've found is exactly the opposite. When you come to the realization that you are indeed loved by God, you will want to respond to that love, not from a place of fear, but out of a genuine sense of gratitude. Our psychology does not allow us to love someone we fear. We cannot mix fear and love. It doesn't work that way. And this attempt to try to force people to either love God or face eternal punishment, has done enormous harm. Don't take my word for it. Look to your own experience. Can you love someone that you are afraid of? Does it work? Is it healthy? Or don't you get tired of being afraid? Nick Wilgus is an award-winning author based in Tupelo, Mississippi. Check out his latest novel from Dreamspinner Press, RAISE IT UP, available in paperback and ebook formats.